Bend the clip up with a pair of pliers to let the wire go in & out easier. For temporary fence it is easier to use only the top part of the clip. 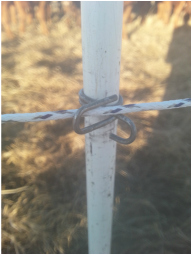 Then twist the post to secure the polywire. For temporary fence hook the poly wire in the long part of the clip. 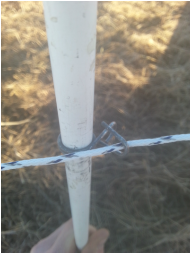 Then twist the post 90 degrees to secure the poly wire as you see on the picture to the right. 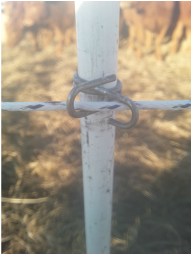 For permanent fence hook the wire through both sides of the clip. 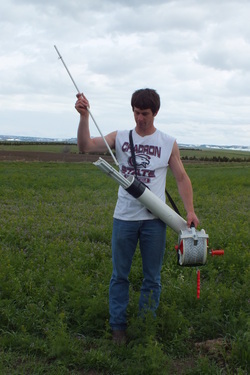 Use a rubber dead-blow mallet to drive them into very hard, dry or frozen ground. A steel hammer will mushroom the top of the fiberglass post. They can even be driven into a 2x4! No mallet is necessary for normal soil. ﻿With a simple handy quiver you can string the polywire and put in the posts on the same trip. ﻿The posts do not get tangled up like the treadin or pig tail posts! 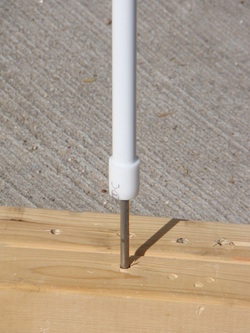 Since they are made out of fiberglass, you don't have to worry about them shorting out and grounding your fence either!